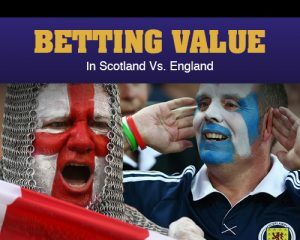 World Cup 2018 keep getting closer and the qualifying rounds are here to get you more betting value as England faces Scotland this evening in a Group F tie of the World Cup 2018 European qualifiers. The Three Lions have endured a turbulent time off the field during the early stages of 2018 World Cup qualifying but have still posted a respectable tally of seven points from their opening three games. While England will look to consolidate their top spot in the group with a victory, for Scotland this will be an important game as they are fourth in the group with four points from three games. This particular match has some extra excitement, FIFA has recently denied permission to both teams’ request of wearing black armbands with the poppy sign emblazoned on it to mark Remembrance Day, these elements make the match more fun and more interesting, as if the importance of the mixture and the rivalry of the nations wasn’t enough already. Teams are getting ready for the match and so are punters. Gareth Southgate, England’s interim manager, has confirmed that Manchester United striker Wayne Rooney will lead the side. The England U-21 manager took charge of the senior team for four games following the departure of Sam Allardyce after only one match. West Ham defender Aaron Creswell has been called up for the first time, while Southampton keeper Jordan Pickford joined the squad as well because of injuries to Danny Drinkwater and Fraser Forster. Danny Rose has an injury concern and the Spurs defender is doubtful for the match. His club teammate Kyle Walker is another doubt on the right back with Liverpool defender Nathaniel Clyne available for selection if needed. It is a big game for Scotland midfielder Scott Brown who has come out of retirement and he is expected to start. He retired in August to concentrate on his career at Celtic but has changed his decision now and is facing a battle to be fit for Friday’s game. Blackburn defender Charlie Mulgrew has been called up after returning to Championship action. Hull City‘s Robert Snodgrass has admitted to being not 100% fit but the midfielder is expected to start against England. Steven Fletcher is a doubt for this tie after injuring his knee. Scotland manager Gordon Strachan has called up Blackburn Rovers’s Charlie Mulgrew who can play in midfield or defence. Possible Scotland Starting Lineup: Marshall; Paterson, Martin, Hanley, Kingsley; McArthur, D. Fletcher, Brown, Snodgrass, Fletcher, Ritchie. There have been only three goalless draws in 111 matches played between the two teams. England is the overwhelming favorite to win this match with a 4/11 line. Rooney, England’s record scorer with 53 goals, will be looking to get back to goal scoring form again and he is 9/2 to score the first goal of the match. Scotland is struggling in fourth place and a defeat to England at Wembley could end all hopes of qualification. The last time when England and Scotland met in a competitive fixture back in November 1999 at Wembley, the visitors won 1-0 thanks to a goal from Don Hutchison, but they lost the Euro 2000 play-off tie 2-1 on aggregate.